The recruiting process is constantly changing, and the pressure college coaches and athletes go through is unreal. Not very long ago I was a collegiate athlete. And just a few years before that, I was a high school athlete weaving my way through the recruiting process. It was very challenging. There were many times I was unsure if I’d ever find a place to play. But like all athletes, I figured if I worked hard and kept grinding, something would work out for me. It’s kind of like the old saying, “the game will find you.” I was hoping it would happen to me. However, if I knew what I know now – about recruiting – the process would have been significantly less stressful. Below, is a list of seven things I wish I had known about the recruiting process. Hopefully, they will give you some insight and help those who aren’t sure what to do. The Recruiting Process: When is it Too Late? Like all young athletes, I always wanted to play in college, but it probably wasn’t until high school that I started pursuing that dream. When I sat down my junior year and looked at schools I wanted to attend, I had no idea that most universities were way ahead. Yes, for most college coaches, recruiting classes are fill up three or four years before that class even graduates. I felt like a complete idiot emailing coaches my information and getting a response that they were already full. In the back of my mind, I probably thought the Big D-I schools like Alabama, Florida or Stanford, were the only ones that far ahead. But nope. Now, a lot of college coaches are recruiting earlier and earlier to stay competitive. I remember getting countless letters or emails inviting me to prospect camps. I always wondered how that coach found me. Sometimes I even thought the letter meant they were recruiting me. But it wasn’t until I became a college athlete that I realized only a fraction of camp attendees convert to prospects. I also realized that those letters don’t mean a coach has seen you before, or that you’re even on their radar. In my four years in college, our coach watched very few prospects at our camps. I’m not saying a camp attendee never turned into a prospect, but the majority didn’t. Where I wanted to attend college was far from where I lived, and with 1,500 colleges or universities, across the country, playing well in your area doesn’t mean college coaches know that. Schools close to you may know or hear about your abilities, but it doesn’t mean all college coaches will know whether you’re playing well or not. If you’re like me and have a desire to play somewhere outside of your hometown, it’s hard to accept this, but it’s true. I assumed that if my team was winning and the game stats were out there, college coaches would find me. Again, after I played in college and my teammates turned into coaches, I realized how far off that assumption was. I can tell you that the number of exposure events out there has tripled since I went through the recruiting process. I attended every single camp or tournament I could when I was in high school, and going to all of those events wasn’t a bad thing. They are crucial in the recruiting process, but where I fell short was thinking that was enough. Again, I assumed that coaches would see me there and instantly remember or notice me. That wasn’t the case. There’s so much more that needs to be done to make a lasting impression and to stand out. Thinking back, I 100% thought that I could send an email, letter, postcard, and whatever else to a coach and be just fine. To be completely honest, those things are great. However, it’s hard to tell if coaches even read those forms of communication. College coaches receive hundreds, if not thousands, of emails or letters a day. The best way of communicating with a college coach is picking up a phone and giving he or she a call. But that wasn’t easy for me, and I know I wasn’t the only person who felt that way. It wasn’t that talking to a coach on the phone was hard. What I struggled with was mustering up the courage to talk to college coaches that I had never actually met. So, I wish I had known what to do to communicate with a coach effectively. A lot of people know the basics of what to put in a video, it would have been better if I knew what specifically coaches wanted to see or know about me. Did they want something in the video that showed my personality? Does that matter? Did they want something that only displayed my skills? How much of the video should be game footage versus practice? These are just some of the things that would have been nice to know for my skills video. Think about this: for some, the skills video is the first contact they may have with a college coach. So it needs to have all of the important things displayed and be what coaches want to see as well. To be completely honest, a lot of the time I felt like I was on an island, alone. And now that I’ve been through it, and I got to experience it from an outsider’s perspective, I know I wasn’t alone. Yes, with recruiting you’re competing against everyone. However, most of your teammates, competitors and other athletes you meet, are at the same point you are, probably wondering the same things and not sure what to do. These are just seven things I wish I knew, my parents knew, and my coaches knew, about the recruiting process. I got lucky when I went through the recruiting process and happened to find a place to call home for four years. Without a doubt, I believe, if I had known half of the things I know now, I would have had significantly more options. Having options to play in college puts the ball in your court. You have the ability to leverage scholarship offers and potentially earn more money to attend a certain college or university. Don’t get me wrong, I love where I went to college, and I would never trade that experience for anything, but having options would have been nice. National Scouting Report’s scouts know the NCAA recruiting rules and what athletes need to do to get noticed. 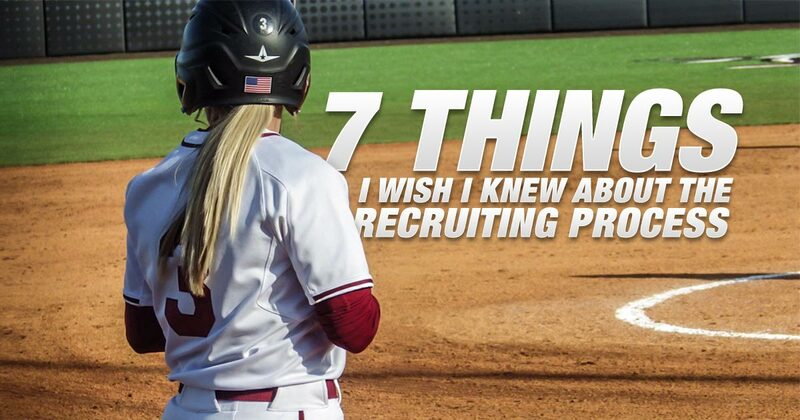 They know the answers to these seven recruiting questions and 100 more. NSR scouts talk with college coaches daily, they work as liaisons between athletes and coaches to help the communication process. Today, it’s all about who you know that gets your foot in the door to play collegiate athletics. The recruiting process is tough, but NSR scouts can help you get to the next level. This is valuable information! Who can we turn to know where our rising Senior is in the recruiting process? Please advise. Please fill out this form and a scout in your area will get in contact with you shortly!